Freezedryer plays a core and important role in the modern world for preservation without being destroyed even for 25 years as long as it packed well without atmospheric contact. TASTE: Freezedryer preserve the taste in any type of food. It will taste fresh, even up to 25 years later, just as it was when it was first harvested. Food maintains its same appearance, flavor and nutritional content. Freeze drying does not cause it to shrink or toughen. APPEARANCE: Appearance Food maintains its same appearance, flavor and nutritional content. Freeze drying does not cause it to shrink or toughen. LARGE PIECES: Allows you to preserve large pieces of tasteful, high quality food. You don’t have to settle for the small dices or shavings of fruit or meat that you find in store bought, freeze dried products. Prepare it and preserve it how you want it..
REGENERATE: The product can be regenerated into the original form almost by re absorbing water in it after undefined time of airfree packing. We can supply our food freezedryers at a affordable price based on your requirement from 1kg to several thousand kilograms. We can take up the prooject on turn key basis also. 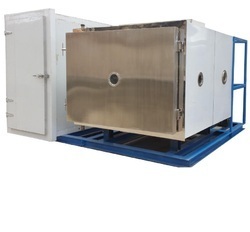 Industrial freeze dryer retains aroma, improves appearance and taste because freeze drying takes place at a low temperature which minimizes heat damage and retains volatile components (aroma). It also increases the shelf life of the dried product as compared to standard drying practices. 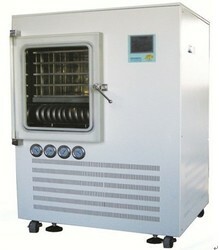 Freeze-drying involves dehydration of food products at low temperature and pressure. As a result only the moisture is removed, leaving the molecular structure intact. The end product is light in weight with least or no change in volume. Worldwide freeze-drying technology is considered as the ultimate amongst all other dehydration methods. Hence this technique is currently being used for the production of instant coffee, instant tea, fruit pulp and other heat sensitive products. Dehydration / Drying of food products. We are offering wide range of Freeze Dried Food Storage to our customers from all over india. Our product details are following. Material plate: General type: Specially designed stainless steel sample holder, adjustable sample tray spacing, number of layers set free; drying plate diameter 200mm, a total of four; material can be placed approximately 1000ml (material thickness 10mm). We are a trustyworthy organization offering a wide a gamut of Freeze Drying for Food Preservation. Model LG10 is our latest model PLC controlled freezedryer to load 150kg fruits/vegetables/food for freezedrying including for cut fruits and vegetables. The side by side freezer unit with additional set of trays will allow pre freezing of the samples without time loss for next batch freezedrying. 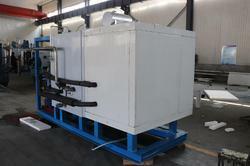 The chamber and trays are made of SS 304 food grade to get optimum result in freezedrying. 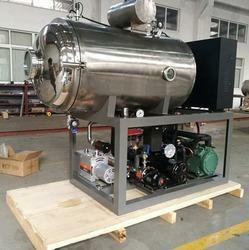 High efficient compressor, condenser and vacuum allows quality freezedrying in the long run. 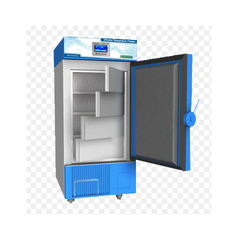 EBT 60N is our latest model Freezedryer to accomodate 6kg food products like fruits/vegetables/read to eat food etc. with precise freezedrying and the food can be pre frozen in side the condenser chamber for effective prechilling before freezedrying. This six tray model will accomodate each litre/kg food sample for quality freezedrying and our high quality compressor, condenser and vacuum pump ensure long and trouble free performance of the machine.